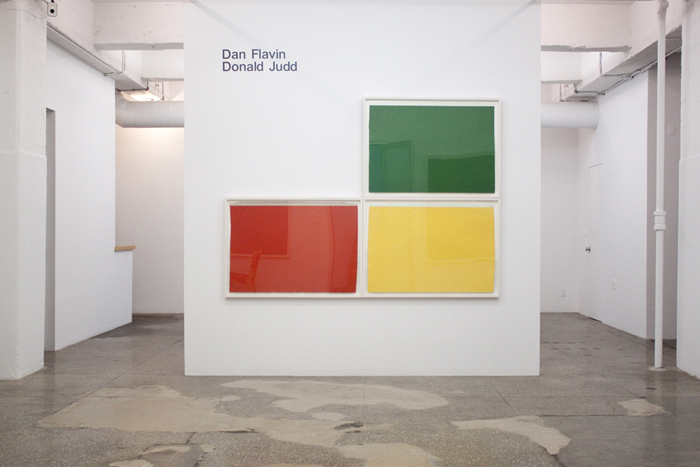 Senior & Shopmaker Gallery is pleased to present Dan Flavin/Donald Judd: Sets/Series, featuring rare print portfolios which illuminate differences and similarities between two artists who enjoyed a friendship and conceptual kinship spanning over thirty years. Printmaking’s complex, mechanical, and collaborative processes perfectly suited the Minimal aesthetic, which sought to relinquish evidence of the artist’s hand through the creation of serial images. 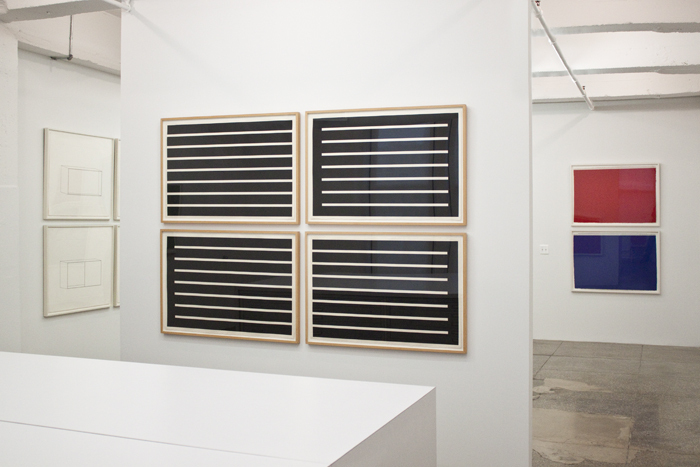 A heightened awareness of printing techniques and their unique visual possibilities led Minimalist artists, including Flavin, Judd, Sol Lewitt, Brice Marden, Agnes Martin, among others, to accentuate the physical properties unique to prints. Both Judd and Flavin embraced and emphasized the negative space and edges of the paper as well as the distinct surface qualities of printed ink. Donald Judd’s exploration of woodcut, a medium offering an unmodulated flat surface, began in 1960 and continued to the year before his death in 1994. This exhibition includes Untitled 1991-94, a set of four woodcuts printed in black on Japanese paper, as well as an earlier suite of sixteen line etchings from 1977-78 more clearly related to Judd’s plywood and steel sculptures of the period. Each image depicts a volumetric box, identical in scale but unique in format. Best known for his fluorescent light installations, Dan Flavin was also an avid draftsman and printmaker. Working at Gemini G.E.L. in Los Angeles in 1987, Flavin created a series of seven lithographs on a variety of handmade papers, each a single color: red, pink, yellow, orange, blue, green, and red-violet. Sharing the same title, To Don Judd, Colorist, of a cycle of sculptural works of the same year, the prints’ coloration refers not only to the fluorescent hues of Flavin’s work, but also to an under-recognized aspect of Judd’s sculpture: color. Gallery hours are Tuesday-Friday, 10am-6pm and Saturday 11am-6pm. For further information, please contact Betsy Senior or Laurence Shopmaker, at 212-213-6767 or at gallery@seniorandshopmaker.com.